Wanda the Irish Staffie puppy caught in the act of chewing the coffee table! "Here are two pictures of my Golden Labrador Lilah caught ripping the tissue box (that was on the coffee table) and shredding the tissues everywhere, just for fun! I was upstairs for about five minutes and I came downstairs to find this mess. She is 3 months old and can be destructive and "evil" at times (if she sees someone leaving the house and closing the door on her, she HAS to grab a shoe and take it out to the living room) but she is mostly happy and loving :)"
Charlie the Puggle at 5 months old caught in the act! "Down, Charlie! Drop that newspaper!" Stella Bella a Chin / Cavalier King Charles Spaniel / Pekingese cross CAUGHT trying to steal the last bit of pizza! Jackson the Goldendoodle puppy at 4 months old. 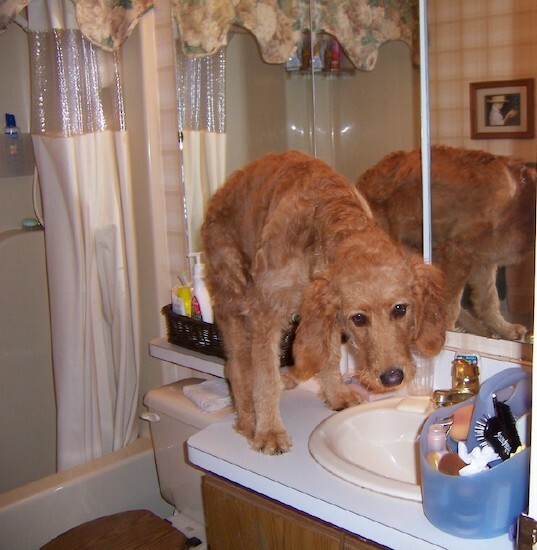 "Mr. nosey didn't realize there wasn't much counter there until after he jumped up!"